So I did a swim meet on Saturday (Feb 4), my first since 8th grade. I did a reasonable taper of swimming for the meet, but still did a fair amount of running to start the week. Overall, my biking has been on the back burner to allow a strong focus on swim and run to start this season, hoping to firmly cement the strides (pun intended) I made with my running last year and to shore up swimming, which continues to be my weakest link. A nice easy day the Friday before the race, with just a short sharpening swim, had me feeling pretty good. I had hoped to swim the 1650, but the mile takes a long time (obviously), and so at pools where clubs need to rent out space, it’s tough to add on another hour or so to swim one more event. So no 1650. Instead I swam the 500, 1000, 200, and the 4×100 relay as the lead off. 500+1000+200 is usually pretty close to a straight 1650 time, and my goal was to break 18:30 for 1650, so I was hoping to do that for my combined total from my three events. The 500 was first, and I had an average swim. I was in the last heat, seeding a 5:23, though my goal was to break 5:20. I started a bit too fast, despite not having the best start off the blocks, and missed having a clean turn on a wall or two. I went 5:23, which was good, but I thought 5:20 was doable, and I still think it was with a bit better pacing and a cleaner start and cleaning up those few walls. I had about 2hrs between the 500 and the 1000, so lots of rest. The 1000 was my best event of the day. I had seeded a 11:10, but I paced it really well, negative splitting to come in 10:59, going 5:31, 5:28 by 500. I think that this clearly shows I should have (and could have) been faster for the 500. I was really pleased with my performance in the 1000. In both the 500 and the 1000, I had good duels with the swimmers next to me, and I was really able to capitalize on it in both events, with both times being PBs for me. I did learn after that I should have attempted to draft off the guy next to me, who swam about 1/2 a body length up and on the lane rope for much of the race. Lesson learned. I hope. It’s hard to think rationally when you just want to get more air. There was about 45min rest until the 200, and while I was tired, I was also too conservative on the start, and, unfortunately, was also almost the fastest person in my heat (2nd to last), so I didn’t get to chase the faster swimmers as I had hoped. Was shooting for 2:02, but I went 2:04, which was my seed time. A guy in the outside lane took the heat with a 2:03 high, but I didn’t really see him and so missed out on really racing him. The 200 is probably the hardest event to pace correctly, both for me and, I think, for swimmers in general, because – like the 800 in running – it’s not a sprint but you also need to be right on the rivet (and even slightly over it) the whole time. I’m hopeful we can organize some 200 races in practice, as it’s short enough to do often and do well, but still teaches you a lot about racing and pacing. Then it was about 30min rest until the 4×100. I had a good lead-off, but still need some practice off the blocks. Went 58.44 which was pretty good, and that was really more close to the sort of start that I should have had for the 200. I’m not a sprinter by any stretch, and while I wasn’t eager to swim another 100 after my 100 lead off, I think had I not really hammered the last 25 coming home, I probably could have swam another strong 100, getting me closer to the 2:02 I had hoped to go in the 200. Overall, my combined time from the 1000/500/200 was 18:27, so I met my goal of sub-18:30, and I do think that I could confidently swim that for the 1650, maybe even faster as I do tend to, relatively, do better in the distance events. Not too surprising given my background I guess. Special thank you to the folks at TYR, who I met as a result of racing ITU Long Distance World Champs in the official USAT uniform, which is made by TYR. Ryan and Jill and the gang at TYR were nice enough to provide me with a Tracer racing cap and jammer, which offers a definite boost over my old polyester brief when it comes to fast swimming. Congrats on the solid swims. Any way you could do a blog on your swim time progressions over the years? I know you have dramatically improved your swim through the years, and I would love to see the yearly comparisons of pool times/kms week. Train more, get faster. The fact that the how much you train doesn't always correlate to a definitive increase in speed doesn't bother me. Some speedie times. 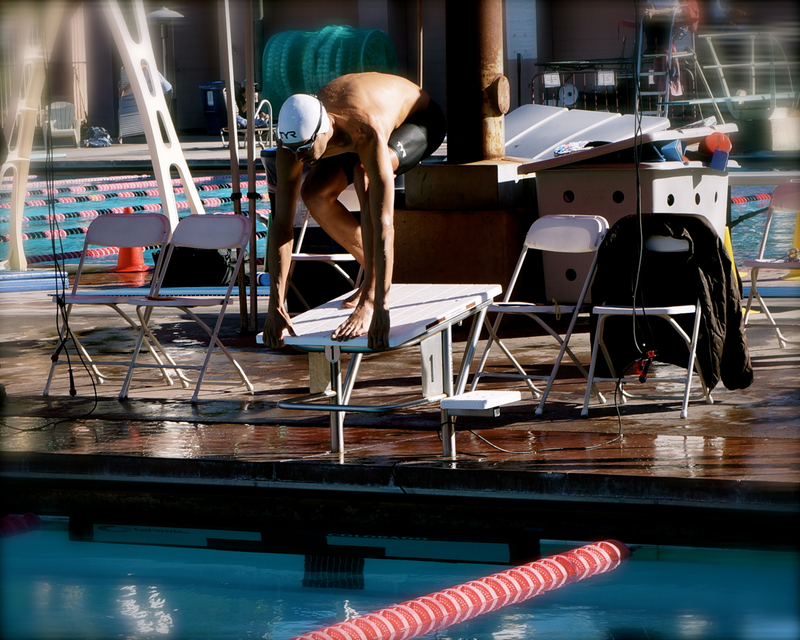 I would love to get a few rips on the blocks again some day.